Xherdan Shaqiri in action for Liverpool. At the start of the 2018-19 Premier League campaign, I wrote an article stating that Xherdan Shaqiri was the best summer signing in England. I still stand by that statement, however, Jurgen Klopp has failed to utilize Shaqiri over the course of the season. That being said, the Swiss international would be wise to put in a transfer request this summer and search for a new team. Yes, it is true that if he stays with Liverpool he has a great opportunity to win some trophies, but a ceiling is being placed on his individual potential. Thus far in the campaign, the 27-year-old midfielder has made 21 appearances, primarily as a late substitute, and has six goals and two assists to his name. Shaqiri has sufficient talent to be a regular starter for the Reds and he has four years of Premier League experience under his belt. Liverpool had plenty of competition when it came to securing Shaqiri's services after Stoke City were relegated last season and he showed just how dynamic he can be with stellar performances in pre-season friendlies. 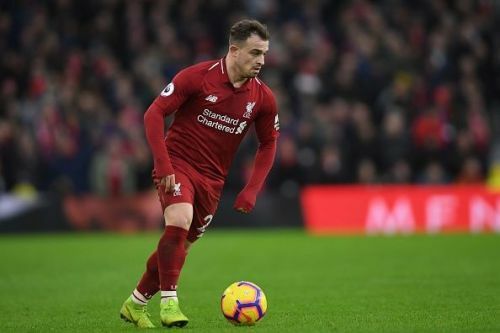 In the Premier League this season, Shaqiri has been a reliable midfielder who has scored goals against Cardiff City, Fulham, Burnley, Newcastle United as well as a brace against Manchester United as a late substitute. According to statistics from WhoScored, Shaqiri has only been on the field for 1017 minutes out of the possible 2610 minutes. This means that Klopp has left the "Messi of the Alps" on the bench for 1593 minutes this season. Some of you, especially Liverpool fans, disagree with this premise, but it does not make any sense for Shaqiri to ride the bench all season and only play for 15 or 20 minutes in most matches. This is exactly what happened to him when he joined Inter Milan in January of 2015. Everyone praised Roberto Mancini for convincing the former Bayern Munich midfielder to join Inter, but despite playing well Shaqiri was left to waste his talent on the bench. As a result, he put in a transfer request and signed for Stoke City eight months later. The Swiss international is in dire need of a move away from Anfield, especially now that he is in his prime at the age of 27. This time, however, the dynamic midfielder must be wiser if he does decide to pursue a move this summer. He has experience playing in Germany, Italy and England, so he must determine what style of play suits him the best and what teams he could have a meaningful impact for as a regular starter. Based on his team selections in the past, it is quite clear that Shaqiri values playing in continental competitions and he wants to play for clubs with a history of winning. However, he should not rule out playing for some mid-table sides in the Premier League. Most mid-table clubs in England are only one or two talented players away from knocking on the door of the top seven. That personal suggestion aside, it will be interesting to see what Shaqiri will decide to do in the summer. He could stay and fight for his place on the team or he could take his talent elsewhere. It will also be interesting to see what price tag Liverpool will place on Shaqiri after purchasing him for a bargain price in the summer.